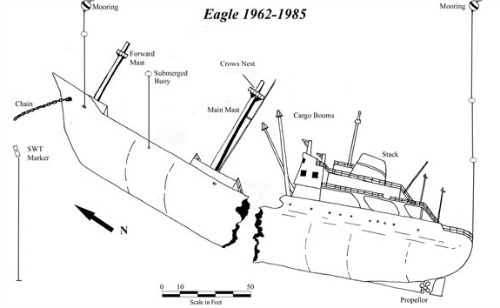 Include the Eagle Wreck on your next dive trip if you have advanced scuba diving certification and are on a Key Largo vacation. This ship has operated under numerous names and over the course of her short life, changed ownership many times. In fact, the number of names and owners she's had could easily rival the number of daily dive charters operating out to her. Lying at a depth of 120 feet, she's found offshore of Lower Matecumbe Key, or 3 miles northeast of the Alligator Reef light. Built in The Netherlands in 1962, she had a length of 287 feet with a 40 foot beam. The Danish company who originally owned her called the freighter the Raila Dan. In 1969 she was sold to another company who then renamed her Barok. In 1974 she once again changed hands, being purchased by a company operating out of Haifa, Israel, who renamed her Carmela. Shortly thereafter in 1976, she was purchased by another company stationed out of the Cayman Islands who changed her name to Ytai. In March, 1977 she had her first fire, which started in the engine room causing her to be declared a construction loss. Her owners sold her to a company based out of the British Virgin Islands, who repaired her and changed her name to Etai. In 1981 she once again changed hands, this time to a Belize company who christened her Carigulf Pioneer. In 1984 she was sold back to another Cayman Islands company where she was given the name Arron K. For this company, she transported newspaper and cardboard between Miami and Venezula. It was on October 6, 1985 while en route to Venezuela, that she suffered an electrical fire. This time her superstructure was seriously impacted beyond the point of affordable repair. Docked at Miami River, this was the end of the road for the Arron K. However, the Monroe County Tourist Council along with other interested local parties came together, and purchased her as part of their Artificial Reef Program. $50,000 later, the ship was once again under new ownership and prepped for her final voyage, but not before being christened the Eagle Tire Co. In preparation for her scuttling she was towed out to the Florida Keys National Marine Sanctuary. There, she was positioned about 6 miles off Lower Matecumbe Key, or about 3 miles northeast of the light at Alligator Reef where she was scuttled on December 19, 1985. Typical with the sinking of most ships is the unpredictability of the whole event. This was no exception. She had been moored to the Alexander Barge where she was intended to settle, but she broke free. To avoid the current taking her further, they dropped her port anchor. Instead of returning her to the original position, it was decided to let her sink where she was. With the help of the Miami and Dade County Bomb Squad and the $873 load of explosives she carried, she sank in 90 seconds on her starboard side. Of course this was another scuttling glitch because she did not end up in her intended upright position. In 1998, her position changed once again, when the strong winds and waves from Hurricane George managed to rip the vessel in two. Amazon has a number of dive maps for the Florida Keys including these for the Eagle wreck. So you know, as an Amazon Associate I earn from qualifying purchases such as these items. superstructure will be at about 70 feet depth. As you continue on to her final depth of 115 feet, you'll see that each section of this ship is becoming encrusted with coral, and that she houses a variety of tropical and game fish. If you're Key Largo diving this area, when finning around the bow section you'll encounter her port side anchor chain positioned away from the ship. You can follow the chain until it disappears into the sand, and you'll be able to spot the anchor located a bit further from the Eagle Wreck. The bow section also contains one of the masts with crow's nest and ladder resting on the sandy bottom. As you fin over to the stern, you'll come across the other mast and crows nest with it's ladder lying in the sand. When you reach the stern, you'll encounter her tandem cargo booms, and still affixed large, four blade propeller. This Amazon dive map shows her deck area in greater detail. She has several deck levels with additional features that are well worth exploring, including railings, the bridge deck and smokestack. As you move around the Eagle wreck, you'll also encounter a fairly broad debris field which includes bits and pieces of her hull and mast. Proper care was taken when the ship was scuttled, so cables and wires were removed, along with doors and hatches. Cut outs were also made in her starboard side and holes blasted in her hull to provide for swim throughs to make it easier for diving into the wreck. These points of entry became redundant when the ship landed on her starboard side. They have however created a paradise for fish such as goliath grouper, eel and shark, who like to hide out. Typical of most Key Largo diving sites, you'll find that the visibility is usually quite clear at the Eagle Wreck. This means you'll have a good overview of her form as you descend and multiple opportunities for underwater photography shots. When scuba diving Key Largo you'll often find that current strength varies from dive site to dive site. At this wreck site, the current is often variable, ranging from moderate to strong. Since you won't always know what to expect, to be safe, hold the mooring lines attached to either the bow, midship or stern area as you descend and ascend. Moderate to strong current can be found here, with occasional slight current running over her. She rests on starboard side with bow pointing towards shore in 115 feet of water on a sand bottom. Without proper certification, equipment and lighting, penetrating this wreck is not recommended. 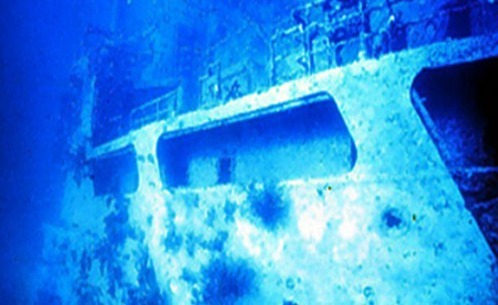 This wreck is frequented often by Key Largo dive charters so access is no problem. Even though the Eagle Wreck was just a typical coastal freighter of no significant importance, she's rapidly become one of the best advanced Key Largo dive sites. Not only does she provide structural interest, her highly diverse marine life continues to evolve with her, in her new role as an artificial reef in the Florida Keys.